AMBASSADOR21 vs. SUICIDE INSIDE “Life Is Mortal Art (Live At Maschinenfest 2k18)” out now! Home albumsAMBASSADOR21 vs. SUICIDE INSIDE “Life Is Mortal Art (Live At Maschinenfest 2k18)” out now! AMBASSADOR21 vs. 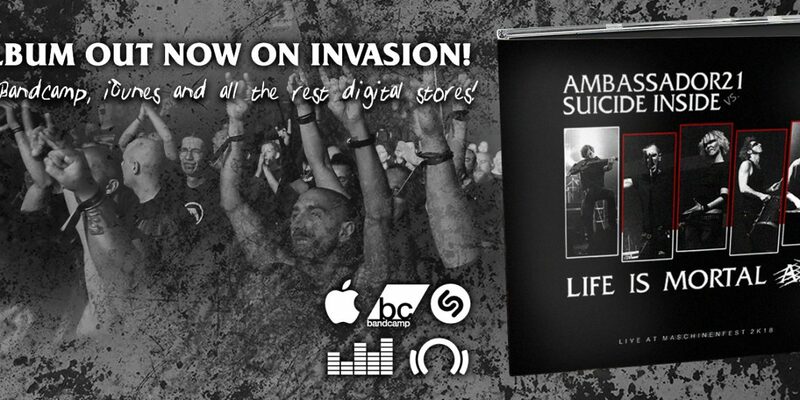 SUICIDE INSIDE “Life Is Mortal Art (Live At Maschinenfest 2k18)” (digital album) OUT NOW on Invasion! Available in our online store, Bandcamp, iTunes, Amazon, Shazam, Google Play, Tidal and around 250 more shops!